Mark has over 30 years of sales and marketing experience, both in manufacturing and sourcing quality products for major UK companies and retailers, which has provided Mark with the necessary skills and commitment to provide his own customers with the quality of service they expect and deserve from one of the leading supplies in garden fencing, ColourFence. When Mark discovered ColourFence and it’s durability, guarantee and low maintenance features, he immediately knew that he wanted to get involved with the company as he realised just how revolutionary this product was and what a practical solution it would be too many. 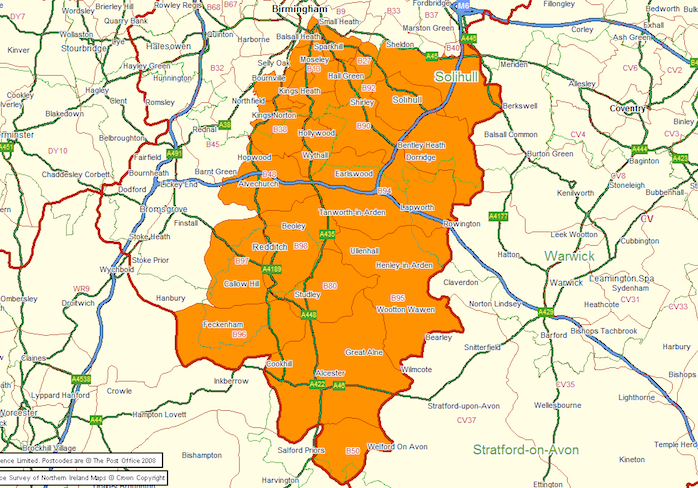 Thus ColourFence Solihull was born. Mark visits customers on a daily basis and thoroughly enjoys the fact that every project is unique and each customer has different reasons behind wanting a ColourFence; some of his customers want ColourFence because they want a robust & maintenance-free alternative, some want it because they want an eco-friendly fence, and others want it to help make their garden more secure. 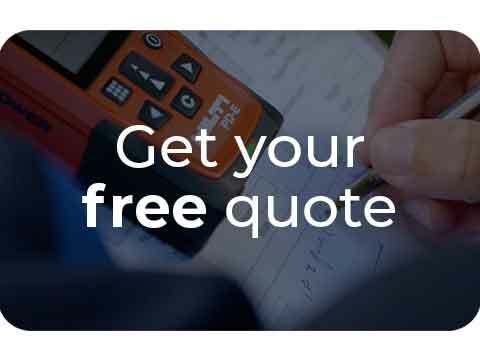 If you’d like to discuss options with our Solihull & Birmingham fence fitter, Mark, then click the link below and book your free, no obligation site survey and quote. "We had our first ColourFence five years ago and have just completed our entire property with a second phase and are so pleased. We decided never to have another wooden fence. The metal fence is a bit dearer initially but it's a good investment because it certainly pays for itself over time and adds value to the house. The best thing for us has been the peace of mind it gives you knowing that no matter how strong the gales in the night you won't find panels blown down in the morning, and we will never need to patch-up or paint a fence ever again. The fitters Mark and Sam were very pleasant and professional and we now have a written guarantee, which is a good selling point if you want to move." "A friendly, courteous, and professional service, from Mark and his team, from initial quote through to final installation. We are delighted with the fence, and wouldn't hesitate in recommending them." 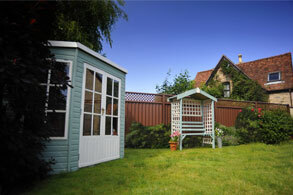 "I am just writing to thank you for the professional way in which you installed our ColourFence. I had initially considered the normal wooden fencing but had heard about metal fencing and contacted you to ask about the product. I am so glad that I did. It became clear that in terms of upkeep ColourFence was the obvious choice with no maintenance necessary other than an occasional wash. The fence looks wonderful and we have had some lovely comments about it from our neighbours. I would highly recommend you to anyone to install their fence. The work from start to finish was first rate and seamless." "Mark was so helpful and positive from our first planning meeting. Despite there being concrete posts and baseboards, and a well established planted garden, Sam & Mark were as careful as they could be, and made easy work of removing the old fence and the new one flew up in no time. Sam's attention to detail and explanations as the fence went up were reassuring. We were a bit nervous opting for steel, but can honestly say we are over the moon with it. We opted for a quirky colour scheme and it works brilliantly for us. It looks so much more classy and is admired by everyone." "We found ColourFence brilliant, when Mark first came to our house to have a chat and see what was needed, he was friendly told us about colour fence, there was no hard sell, just said as it was, when he left both myself and my husband said how refreshing it was just to say what is necessary without the hard sell. On the day Mark came with another guy Sam, they both got on with their jobs and within 4 hours my old fence was down and most of the new fence was up, I was so surprised of how fast they got on with it. On the second day, It was just Sam and again he was great just got on with fitting the gates and finishing off. He made sure I could lock the gates and also told me if there are any problems just give him a ring and they will come out and sort it. You just can't ask for any more than that. I would 100%, and have, recommend Mark and Sam from ColourFence." "We were delighted with the planning and installation of our new ColourFence. The fence was erected quickly and efficiently. It will be more durable and attractive than the previous arrangement and is especially fireproof. We are pleased to have decided on this practical option." "My wife and I are pleased with the look of our new fence and we have had many favourable comments from our neighbours and people who pass by. It certainly helps make the house stand out and I am sure that it has added value to our property. 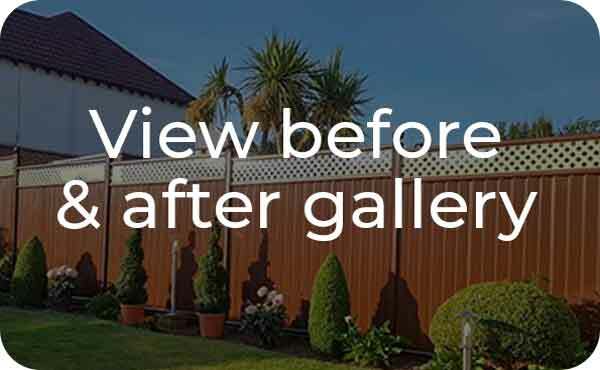 I would certainly have no hesitation in recommending ColourFence to anyone considering buying a new fence or replacing an existing one." "On the day of installation, you turned up on time and in some very wet weather carried on with the installation with the least amount of mess. You showed every respect for our neighbours garden by keeping off his land as much as possible for which I am grateful. I would recommend the product to family and friends wholeheartedly. Thank you again for a wonderful job." "Many thanks for installing my ColourFence. We are very happy with the result and many of our friends have remarked on how good it looks. I am pleased that it has completely met my expectations regarding appearance and functionality. You installed it with a minimum of fuss and in very good time. I would have no hesitation in recommending both you and ColourFence to friends and family." "I am absolutely delighted with the fence. It looks exactly as I had envisaged. Its going to save me a lot of work in the future. My thanks to you and Sam for such a speedy and tidy job." "We are very, very pleased with the fence, it looks lovely and it has improved the look of our home. Thank you for your business, I'm so glad we found you and we wish you well in the future." "Thanks for an excellent job on our fencing. Looks great (posh). Will definitely recommend you. Jobs well done, on time, no mess left. You have both worked hard. Glad rain held off for you." "The way ColourFence conduct their business is refreshingly professional, from the initial sales visits, being here on time, quoting & keeping me informed about installation dates etc, to the actual installation, in this day and age its nice to be able to trust a company to do what they say when they say and in a professional manner - the fencing itself, while not the cheapest option, I do believe is the best option. I had quotes for Wood/Concrete as normal but when it came down to it I chose to pay a little more for the best solution I could afford - and I don't regret it, it looks fantastic and with the fitting and fence guarantee's I'm convinced it was the right choice"
"l am very pleased with my fence and gates, they were done really well with people who knew what they were doing. l would recommend them to anyone"
"From the outset, Colourfence conducted themselves most efficiently and professionally. The telephonist taking my initial call was helpful and explained that I'd be called back by the installer to arrange a visit and no obligation quotation. I was duly phoned and an initial appointment was made. Mark arrived on time to the initial consultation and showed me examples of the fencing material and component parts. He explained the construction process, though I'd viewed this beforehand on the very user-friendly website. He was patient and informative and not at all pushy. He listened to my requirements and then surveyed the garden, took measurements and examined a retaining wall, deeming it safe to erect the Colourfence adjacent to it. Soon after, we received the 2 quotations requested (whole job and half job). There were a few queries regarding the cost to remove the existing fencing which we hadn't realised we'd incur. Mark was understanding and compromised by adjusting the price. In the end, we chose to have the whole job done, complete with trellis and ball finials - which were well worth the extra £5 each as they set the fence off perfectly. Communication was via email which suited me perfectly, as it made the process quick and afforded me a saved record of all paperwork in my inbox. Payment was made by telegraphic transfer which was free, quick and easy to do via my bank. On the day of installation, Mark and his colleague arrived on time and immediately set to work. They covered the lawn with a big tarpaulin to protect the grass and set out their equipment on it. They worked relentlessly, without breaks, removing the old fence and concrete posts. After 4 hours, they'd put up half of the new fence too. When I queried a few things, they explained them to me in a way I could understand, and without jargon. They were really approachable and helpful. It was raining heavily so they had to retire for the day. They returned early the following day to complete the job. 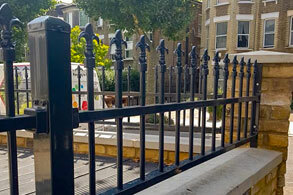 At the end of installation, Mark examined every facet of the job, even painting any screws whose colour had been chipped off during tightening, so they matched the fence perfectly. The job was immaculate. The whole fence looked impeccable and so smart. My neighbours were delighted with it. One even said it added value to the cost of his house. The other is making a seating area on his side as it looks so smart. I had to chase up a final receipt and guarantee, but these were immediately sent out to me when requested. I presume the original email got lost somehow as all other communication was speedy and as expected. I was kept informed by email at every stage and Mark was happy to reply to my queries, and did so very efficiently. This week the weather brought forth extremely strong storm winds and the back end of a hurricane - our fence didn't move an inch. Thank you Colourfence. Your product is wonderful, your service, impeccable and we look forward to 25 years of never having to paint a fence again!" "John and I would like to thank you both for your hard work over the 3 days you were with us. Like I said to you it already has made such a difference and we are impressed with your workmanship. I would certainly recommend you. Thank you again"
"Top marks for a first-rate job, we wanted a fence that required no maintenance at all and having a Colourfence leaflet come through our door we decided to give them a try. From day one having a quote to the job being complete we cannot fault M&D fencing t/a ColourFence, Mark and his mate arrived on time and installed the fence, All the old fence and posts were removed and our garden left spotless and clean, We would highly recommend Colourfence to anyone, great value on price. We now have a fence that has the WOW factor. Thank you to Mark and his team." "We are very pleased with the fence and the efficient way in which it was installed. The timescale given at the point of order was satisfactorily adhered to and the site was left completely clear of any sign that work had been done. My neighbour saw the fence and watched the way that the installation was carried out and was so impressed that he placed an order for one on the spot. Altogether we are more than satisfied with the finished work"
"The fence is fantastic even the birds love it, no problems I'm as happy as Larry, all my neighbours love it and friends who call say they made a good job of that fence." You did and cleared all the rubbish. Its great Mark thank you." "We would highly recommend Colourfence to anyone, great value on price. Fencing looks superb, would recommend to anyone. You were careful in our garden for which we also thank you and Sam." "Ray and I were very impressed with our beautiful new fence. The installation only took a day and Sam and Mark did a fabulous job. They coped with overgrown ivy on rotten wood fencing and unexpected walls and concrete. We would recommend this new fencing as it will last for 25 years and the cost was excellent value." "We are absolutely delighted with our new Colourfence it is fabulous. We were a bit nervous at first not knowing what colour would work for us. Mark came around with some samples and told us where we could view other fences and we watched the videos. Mark gave us a quote and left it with us. We decided to go for it with the blue fencing with same colour trellis. Mark and colleague turned up on the day he said and at the correct time. There was no messing about they put sheets down to protect the garden and worked hard and efficiently to take down our old rotten fencing and took it all away. Then within two days, as promised, the new fence was up. They were very considerate, efficient, tidy, certainly very hard working. We couldn't be more pleased with the results. The flowers pop against the new background it just looks fabulous and lots of our friends have said how wonderful it looks. We would highly recommend the product and most certainly this team. VERY happy customers." "We are delighted with our new fence which has completely transformed the look of our garden. The unique colour we chose provides a lovely backdrop to our plants and shrubs. We thought the fence was great value after comparing quotes for wooden alternatives. The fact that we never have to worry about painting it or replacing broken panels with the 25 year guarantee is a bonus! The service we received was friendly and professional and we would not hesitate to recommend ColourFence to our family and friends." "The product itself is fantastic. Our fence has been admired and commented upon by many neighbours, friends, and passers-by. It has been in-situ now for more than 7 months and it still looks as good as it did on the first day. I have every confidence that it will continue to look and perform well for many many years." 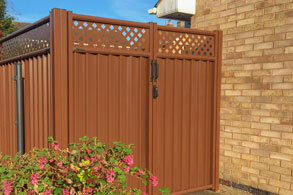 "Our friends and neighbours are most impressed and we would certainly recommend Mark and Colour Fence to anyone." "I would not hesitate to recommend ColourFence, and M&D Fencing Ltd, to anyone who is looking for a stylish, sturdy, and affordable fencing solution."